Yesterday, El-Al announced the launch of their new lost cost airline, “Up,” in an act to adapt to competing airlines’ low prices. 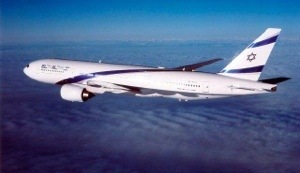 This decision was in response to the low-cost airlines that have been flying to Israel extensively lately from Europe. The five destinations Up will fly to are Berlin (Germany), Prague (Czech), Budapest (Hungary), Kiev (Ukraine), and Larnaca (Cyprus), and each destination will have 11 weekly flights. A one-way fare from Tel Aviv to Prague or Budapest will be $69, and $100 one-way to Kiev, Berlin, and Larnaca. Then from July 1, 2014 and on, fares will increase to $100 to Prague and Budapest, $139 to Larnaca, and $175 in general. Planes will have 2 classes, Tourist and Tourist Plus, with the differences being that Tourist Plus fliers receive free food, beverages, blanket, and an extra 4 inches of legroom while Tourist fliers have to pay for those amenities and have 4 inches less legroom. UP will start flying March 30th, 2014.